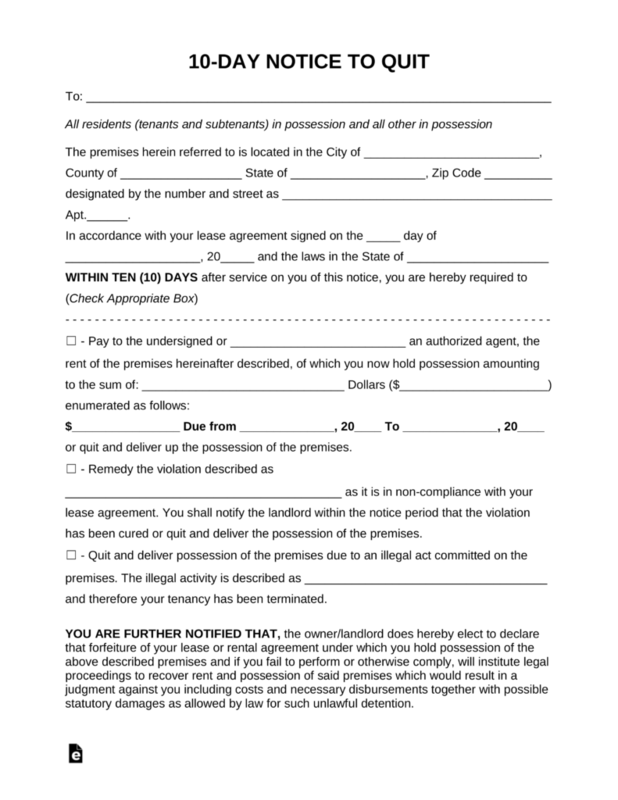 The ten (10) day notice to quit is a document given to a tenant by a property owner or agent to let them know that they are late on their rent or are in non-compliance with their lease agreement for a violation or illegal act. The form should be given the to tenant either in-person, certified mail (with return receipt), or placed in a conspicuous place (such as hanging on the door or slipping it under). The notice is sometimes referred to as a ‘notice to quit or vacate’ as the tenant has the choice of paying the rent in-full or repairing the violation or to leave the premises by the end of the ten (10) day period. Step 1 – Write the name of the tenant that is being sent the notice. Enter the State the residence is located. Non-Payment – The rent is late. Therefore the landlord must enter the person the tenant must pay the remaining balance, the total sum ($) of money owed, and the time period for which the funds are owed. Non-Compliance – List the lease violation that has been conducted on the premises. Illegal Activity – Describe the law or criminal act the tenant committed on the property. 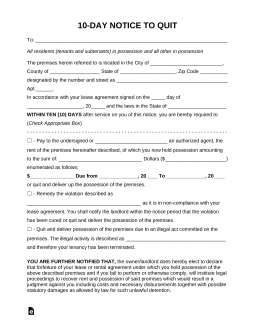 Step 4 – On the bottom of the page, after reviewing all the information and making at least two original copies, the landlord should sign the document. In-Person to a person that lives on the property of legitimate age. In this case, the tenant is often required to be sent the notice by Certified Mail. When the tenant has received the document the time-period begins.